I’m back in the Roma Termini station, shuffling through the masses of the morning melee. Fuzzy intercom announcements, hissing espresso machines and screeching iron brakes of train cars serenade the chaos. I’m on my escape route destined for the Italian Riviera. The railway takes me north three hours, through farmlands and industrial zones, to Riomaggiore, the southernmost town of Cinque Terre. I disembark right in front of the Mamma Rosa Hostel, my home for the next three days. Mamma herself is there to greet me, beckoning from across the platform. “Ciao bello! Mamma Rosa Hostel, si? Buongiorno!” Her petite frame was wrapped in a heavy black trenchcoat, her wispy gray hair and thick glasses beamed out from the upturned hood. I was ushered to my room with an outpouring of generosity. “Grazie mille bello!” I felt as if I was returning home from a long voyage I didn’t know I had taken, and my sweet granny had been waiting for me, counting the minutes until I arrived. It was fantastic. I was waiting for her to say she had cooked a huge meal for me that she had been working on since dawn. I can dream right? Maybe next time, but her warm reception was truly wonderful. I tossed my bag on the bed and set straight out to explore the town. It’s late afternoon, and if I can get my bearings, and find a prime spot, then I can get some great photos of the sunset washing over the village. Cinque Terre is situated along the Ligurian Sea in northwestern Italy. 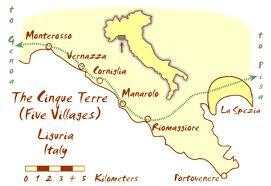 The five villages can all be reached by a single hiking trail, spanning a distance of only nine kilometers. But it’s a bit rougher of a walk than it sounds. To say the terrain is steep and rugged, and that the towns appear to hang by a fingernail high above a treacherous coastline would be putting it softly. But within this daunting landscape lies radiant homes of the brightest spectrum. Nestled along the winding shore, they burst with yellow, pink, green and orange hues, perched on the cliff’s edge. Deep blue waves fall on the land below in white crashes, washing over the dark rocks before going back out to sea. I followed the web of cobblestone corridors up one hill, and down another. Snaking through the sprawl of the hillside settlement. Rough hewn stairways jet upward, bending as to where I cannot see the finale. My hike, thus far, had no clear direction. I was shamefully out of breath and the light was starting to turn. I had to find a clearing soon to get my shot. I made my way in the general direction of west. Around an unassuming corner I emerged onto an open terrace high above the valley. It was the perfect spot, at just the right time, and the photos turned out great! Serendipity was abound in this place. I don’t mind to, and often do, travel solo, but occasionally I think it would be nice to share these moments with someone. I have realized, though, over the years that we rarely travel alone. Lady Luck, a poet’s words or Murphy, with his damn law, are never too far away. I spent the next couple hours editing photos back at the hostel where I made friends with Jean-francois and Michael from Quebec. Fondly referred to as “The Canadians,” they were hiking around Europe for a few months, following the winds each day to their next destination. I was in the mood to check out Bar Centrale after my friend Tim had mentioned it was a respectable den of sin. I was literally headed for the door, when it opened. It was Mamma Rosa. “I knew it,” I said to myself. She was here to give me a steaming plate of lasagna the size of a Fiat! Nope. She smiled and came in with three girls lugging huge backpacks. She said they were American and they would be staying here. Sounds good to me. She also figured that since I was only using one of five beds, that we could all share the room. Whatever you say lady. The new roomies were Jade, Stormi and Lindsey; a feisty trifecta of close friends that were also backpacking across Europe for a couple months. They’re fun-loving globetrotters that met while working in the tourism/hospitality industry, with stints in Alaska and the Virgin Islands to their credit. We became fast friends and decided that the only logical thing to do, after we get a beer of course, is to combine forces and see what Cinque Terre was all about together. The following two days were amazing. The next morning we set out to check three of the five villages off our list. Train hopping throughout the day, we started on the north end of the strand in Monterosso, proceeding through Vernazza and ending in Corniglia. It was an overcast day, which had absolutely no effect on us. We trekked through the tangled mazes of each town, ducking into churches, back alleys and cemeteries with curious excitement. Every turn held a new surprise of scenery and color for us, like we were skipping through Van gogh’s palette. Our day culminated in a breathtaking view from an overlook above Corniglia, where we celebrated with handstands in a dilapidated courtyard. The next day was more of the same. Just as thrilling, just as wonderful. We rounded out our tour with a visit to Manarola before returning to Riomaggiore. We swam in a nearby cove that afternoon before the girls, and the Canadians, had to catch the evening train to Pisa. I left the next morning. But, as we were bobbing in the ocean, with smiles a mile wide as the sun warmed our faces, I was filled with honest joy. It was a simple moment of true happiness we had made with each other. The serenity I had hoped to find here was most certainly here. We luckily, thankfully, had found ourselves in the same place, at the same time, and wanted to share our experiences with each other. In a couple short days strangers became friends and our own stories became shared memories. My thoughts went back to Paris, sitting in Charline’s living room with her family. It was the same thing! The human spirit, and the kindness of people, never ceases to amaze me. The unexpected is the often the unforgettable. p.s. The girls came to visit me in Tuscania a couple days later on their tour of Central Italy. We went on some fun adventures, made some home cooked meals that definitely deserved a trophy of some sort and cracked a few more inside jokes! How did you girls know I loved tiny winged pony dolls? Previous PostAsk, and you shall receive: Tuscania, Italy.